It caters to both equally, what do you mean you think it caters to Xbox? There will be a fix yes. No need to mess around with ports or anything like that! I got the same issue: it's just a bug, don't worry about it. I bought the router in the end. I do not know about others, but I believe mine has a problem. The sliders don't work at all and I realised this after a week. No matter what I do the speed stays at maximum. I rebooted it several times and tried different sliders setting. Any idea? It sounds like you may have it set to Apply 'Never' but most likely you have enabled 'Disable QoS' in Anti-Bufferbloat's settings, is that the case? hey, thanks for the prompt reply. everything is setup correctly: bufferbloat always on, QoS on. Have you set your bandwidth speeds to be higher than what you actually get when direct to the modem? I have quickly installed the latest firmware and did a factory reset and it seems the sliders work right now. I will keep you updated if the issue comes back again. The sliders work fine now. But I can't get FIFA and StreetFighter V to work. In FIFA I monitor the connection and there is no spike while pinging the guy I play with in Seasons (I play only against people with lower ping than 35 ms) and it still lags like crazy. It worked perfect for 4 days (Saturday last week until Wednesday morning). Since Wednesday FIFA has been unplayable. I tried the sliders everywhere, I tested everything. I don't know what to do anymore. Also make sure you use the Geo-Filter to guarantee a local server / opponent. Trust me, I am making sure I get a local connection. Now, I am confused. 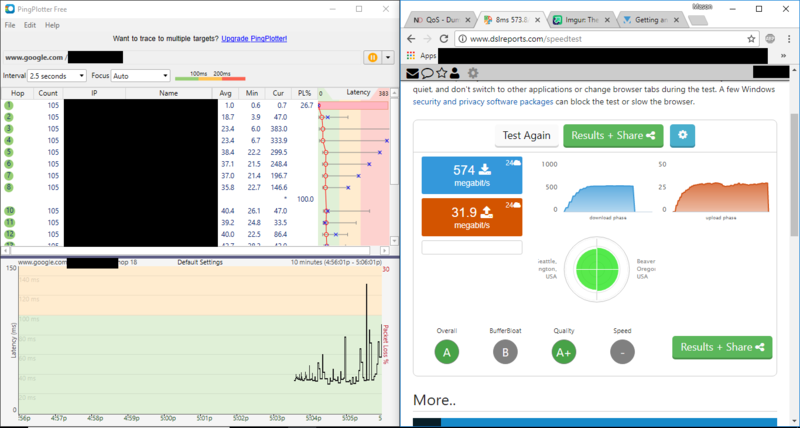 I read something on the forum that ping plotter has a packet loss bug. How will it be reliable, if there is a bug in it? The bug only happens if you set the interval to 1 second. I had this same problem with the Asus AC86U and am now experiencing it with the XR500. I thought that since the R1 handles everything so well in this regard I would have much better luck with the superior hardware on the XR500 with DumaOS blend - oh boy was I wrong. Same spikes, same problems. How is this the case being that it's using essentially the same software to route everything? I have a Gigabit connection with 994 down/42 up. Don't have a very sophisticated setup either I'm using an SB8200 Docsis 3.1 modem. Have CC at 70% for both (have experimented with no luck). Btw I see pingplotter being recommended as an alternative, but truly it's not. PingPlotter traffic is so minuscule that it's not subject to the same level of congestion that typical traffic would be. DSLReports bufferbloat test is indeed accurate unfortunately. 70% is a recommended starting point but it doesn't work as well for everyone as all connections are different so we encourage users to experiment, I'd recommend trying lower and higher percentages and then testing to find the best percentage that eliminates congestion as much as possible. I believe the high baseline ping is just how it's routed. Sometimes it'll dramatically change to 15ms and stay that way until another hop comes into the fold. That's when pinging google.com and others at times too. I believe it has something to do on their end with a persistent connection.